This study was supported by grants from the Conference on Jewish Material Claims Against Germany, the Anti-Defamation League and Richard Rockefeller, M.D. The authors wish to express their gratitude to the rest of the study team: Brian Engdahl, John Fairbank, Jenni Frumer, Jutta Lindner, Sigal Pearl Naim, Vera Paisner, Julia Richter, William E. Schlenger and Karen Judd Smith. We also thank Michael Berenbaum for his collegiality and generosity of wisdom. This article is dedicated to the memory of Florabel Kinsler who served on the advisory committee of this study until her passing. Corresponding author: Yael Danieli, Director, Group Project for Holocaust Survivors and their Children. 345 East 80th Street (31-J). New York, NY 10075. E-mail: yaeld@aol.com. The majority of Holocaust survivors settled in Israel and North America. While both sociocultural settings offered a new life, Israel symbolized millennial continuity and Jewish identity renewal. We examined within-setting effects of four identity dimensions (intrapersonal, familial, communal, religious/cultural) using data from a web-based sample of 94 Israeli and 328 North American adult children of survivors who completed the three-part Danieli Inventory about their parents, themselves, and their family’s history and characteristics. North American survivor parents showed more intense victim and fighter styles than Israeli survivor parents, although intensity of numb style did not differ. Three of the four measures of identity (broken generational linkages, survival/presence of mother’s mother, and intergenerational continuity in family religious affiliation/practice) had stronger influences in North America: when identity ruptures were low, North American, like Israeli, survivors had relatively low intensities of victim style, but when identity ruptures were high, North American survivors showed relatively high intensities of victim style. These results suggest that the Israeli setting buffered, counteracted, or helped heal at least some of the adverse effects of the identity ruptures suffered by survivors. Affiliation with survivor organizations showed an effect only in Israel: affiliated Israeli parents had much less intense numb styles than both unaffiliated Israelis and North American parents, regardless of their affiliations. Thus, affiliation with survivor organizations appeared helpful in reducing the intensity of numb style in Israel but not in North America. We make research, clinical, policy and program recommendations for Holocaust and other massively traumatized survivor populations. This is the fourth in a series of articles reporting on an Internet study on multigenerational legacies of trauma with adult children and grandchildren of Holocaust survivors. Our goals for the study were (1) to develop and validate a heretofore absent theory-based, comprehensive, multidimensional behavioral measure of multigenerational legacies of trauma, (2) in both English and Hebrew, that would be (3) tailored specifically to survivors’ offspring, encompassing family history and demographics, the heterogeneity of their lived experience with their parents and their upbringing, and their reflections about themselves; and (4) by integrating nearly half a century of rich, complex, albeit inconsistent, clinical, community, and empirical findings, would serve researchers and clinicians alike. The first article reviewed the literature and reported on the creation and related findings of Part I of the three-part Danieli Inventory of Multigenerational Legacies of Trauma: Survivors’ Posttrauma Adaptational Styles (Danieli et al., 2015a), offspring’s reflections on their parents (mother and father separately), home life, and upbringing. The second article introduced Part II: Children’s Reparative Adaptational Impacts (Danieli et al., 2015b), offspring reflections upon themselves. Using data collected in Part III of the Inventory, describing four-generational history and demographics, the third article (Danieli, Norris, & Engdahl, 2015) tested a path model of how family history (Holocaust trauma, age cohort, resettlement experiences) and post-Holocaust family milieu (sociocultural setting and socioeconomic status, family configuration, social support/belongingness, continuity) influenced parents’ posttrauma adaptational styles and offspring’s reparative adaptational impacts. Survivors’ Holocaust experiences, especially internment, had significant direct effects on the parents and indirect effects on their children, and each component of family milieu had one or more effects on the parents and their children. Sociocultural setting (living in Israel rather than in North America) had the strongest effects on parents of any of the predictor variables and appeared to be an important protective factor. In the present paper we study the influence of sociocultural setting in more depth by examining “within-setting” effects of the aforementioned aspects of family milieu. We ask, for example, are the relationships between broken generational linkages and the intensities of parents’ adaptational styles as strong in Israel as they are in North America? To help organize our thinking, we used Trauma and the Continuity of Self: a Multidimensional, Multidisciplinary, Integrative Framework (TCMI; Danieli, 1998). This framework aims to comprehensively describe the complex nature of surviving massive trauma and the diverse ways of adapting to life’s challenges in its aftermath. Its overarching features are its focus on identity, multidimensionality, the ubiquitous conspiracy of silence in the aftermath of trauma, continuity/rupture, longitudinality (systematically considering every short-term action from a long-term perspective), and heterogeneity of adaptation. An individual’s identity involves a complex interplay of multiple spheres or systems, including but not limited to the biological, intrapsychic, interpersonal (familial, communal), economic, cultural (religious), national, and international. These systems dynamically coexist along the time dimension to create a continuous conception of life from past through present to future. Exposure to trauma causes rupture, a state of being “stuck” in this free flow, which Danieli called fixity. The TCMI framework helps guard against the reductionistic impulse to find unidimensional explanations for such complex phenomena and allows evaluation of whether and how much of each system was ruptured or proved resilient, and may thus inform the choice of optimal systemic interventions. Systems can change and recover independently of other systems. For example, there may be progress in the social system but not in the intrapsychic or political system. While there can be isolated, independent recovery in various systems or dimensions, they may also be related and interdependent. To fulfill the reparative and preventive goals of psychological recovery from trauma, perspective and integration through awareness and containment must be established so that one’s sense of identity, belongingness and rootedness are restored (see also Krystal, 1988; Lifton, 1979). To be healing and even potentially self-actualizing, the integration of traumatic experiences must be examined from the perspective of the totality of the trauma survivor’s and family members’ lives (Danieli, 1981b, 1985). Of that totality, we focus here on four identity dimensions: the intrapsychic/intrapersonal (broken generational linkages); the interpersonal/familial (survival/presence of mother’s mother); the interpersonal/communal (affiliation with Holocaust-related organizations); and the cultural/religious (family continuity in religious affiliation/practice). Generational linkages help survivors and their children maintain identities despite ruptures across multiple spheres and systems (Danieli, 1981b, 1985, 1998). When the children think of their murdered grandparents only as their parents’ parents — not as their own grandparents — generational continuity is broken; the family tree is cut (Danieli, 1993). Similarly, how can offspring develop a coherent sense of identity when they know/remember their own and family’s history “only in bits and pieces,” when the family’s continuity is ruptured and fragmented? Arguably, this is the essence of the Holocaust. From the interpersonal perspective, affiliating with survivor and/or Holocaust-related organizations might validate one’s Holocaust experiences in a world reined by the conspiracy of silence, or one’s need to remember, commit to memory or resurrect one’s lost extended family and community. From both the sociocultural and national perspectives, Israel is imbued with meaning for the Jewish people in general and for Holocaust survivors and their offspring in particular. As did remembering, and longing for, Jerusalem for dispersed diaspora Jews for over two thousand years, Israel provided a homeland for the majority of survivors (an estimated 250,000-300,000 as compared with 150,000 who went to North America, Dawidowicz, 1975; Epstein, 1979; Sigal & Weinfeld, 1989; Winnik, 1979), and materialized Jewish continuity for them (and the world) after the Shoah. To Wijsenbeek (1979), as to many others, “Coming to Israel was the logical result of rupture or loss of identity. Israel offered a new identity – new prospects for me and my children. This is the essence of Zionism’ surviving every betrayal by the world.’…It shall not happen again—not here—not in Israel” (p. 73). Despite their diversity, its people have shared a profound commitment to Jewish survival and renewal (e.g., Danieli, 1982; Eitinger, 1980; Kellerman, 2009; Klein, 1972, 1973; Matussek, 1975; Sigal & Weinfeld, 1989; Solomon, 1998; Winnik, 1979). Israel might therefore have contributed to repairing the effects of fragmentation and rupture in the family, community and nation. If so, we should find stronger effects of ruptured identity dimensions on Holocaust survivors and their children in North America than in Israel. Participants were adult children and grandchildren of Holocaust survivors who volunteered to participate in a web survey. Inclusion criteria were that at least one parent or grandparent had lived in or had to leave one of the countries occupied by or under direct influence of the Nazi regime, for any period of time during 1933-1945 (Bogyeski, 2013). The website was visited by 7,222 individuals, including the merely curious as well as those intending to participate. Of those, 2,809 viewed and 789 completed Part I. For studying the effects of identity dimensions, we limited the analysis to the 422 children of survivors who had complete data on Parts I (parents) and II (self) and provided at least partial data on Part III. The attrition of participants between Part I and Part III is likely attributable to the overall length of the survey. Those who completed all three parts did not differ statistically from those who did not on any of the dependent (parent style and child impact) measures (Danieli, Norris, & Engdahl, 2015). Through the web, the principal investigator invited Holocaust survivors’ children and grandchildren to participate in a study on family adaptation to trauma. Information about the survey was disseminated to/by general Jewish and survivors’ and survivors’ offspring organizations and by word of mouth; these organizations had no knowledge about who participated. The web survey was programmed using Gravity Forms (http://www.gravityforms.com). Visitors viewed a welcome page and an informed consent page in English and Hebrew where they affirmed their willingness to participate before viewing the survey instrument. Anonymous data were collected from this convenience sample between June 16, 2012 and December 24, 2012. In Part I, children of survivors answered questions about the behaviors, attitudes, and emotions of each parent separately on a 5-point Likert scale (1 = strongly disagree, 2 = disagree, 3 = neither way, 4 = agree, 5 = strongly agree). Using hierarchical exploratory factor analyses of Part I data (conducted for mothers and fathers separately, Danieli et al., 2015a), we derived three posttrauma adaptational style scales. The 30-item Victim Style Scale (α = .92-.93) encompassed three primary concepts from the lower-order analysis: Stuck in the Loss and Trauma Rupture, Overprotectiveness, and Emotional Volatility and Control. The 18-item Numb Style Scale (α = .89) encompassed Emotional Barrenness (Isolation, Detachment), Conspiracy of Silence in the Family, and Intolerance of Weakness (including expression of emotions). The 12-item Fighter Style Scale (α =.69-.70) encompassed Valuing Mastery and Justice and Valuing and Maintaining Jewish (Group) Identity. English-Hebrew analyses suggested good-to-excellent congruence in factor structure (φ = .87-.99). Part II questions about oneself were answered on the same 5-point Likert scale. Results from the hierarchical factor analysis yielded a single 36-item scale, Reparative Adaptational Impacts (Danieli et al., 2015b), that had excellent internal consistency (α = .91-.92) and congruence between English and Hebrew versions (φ ≥ .95). The final version of the scale encompassed six subscales from the lower-order analysis: Insecurity about One’s Competence, Reparative Protectiveness, Need for Power or Control, Obsession with the Holocaust, Defensive Psychosocial Constriction, and Immature Dependency. We included four indicators of different identity dimensions that met the following two criteria: (1) significant relationships with one or more of the measures of parents’ posttrauma adaptational styles in previous analyses (Danieli, Norris, & Engdahl, 2015); and (2) sufficient variability within each of the two settings. Within the intrapsychic/intrapersonal dimension of the child’s representations of the family’s ruptured history, broken generational linkages was a continuous measure, the average of the respondent’s answers to two related questions, each scored on a 5-point Likert scale of agreement, as follows: “I rarely think of my parent’s murdered parents as my own grandparents” and “I remember my (grand)parents’/’s Holocaust/genocide/war experiences ‘only in bits and pieces’.” Within the interpersonal/familial dimension, presence/survival of the mother’s mother (respondent’s grandmother) was scored 1 if she survived the Holocaust, 0 if she perished. Within the interpersonal/communal dimension, affiliations were originally coded (1) formal affiliation with Holocaust-related groups, (2) formal affiliations with general Jewish groups but no affiliation with Holocaust-related groups, (3) informal affiliations with survivors but no formal affiliations, and (4) no affiliations. The first category included a variety of Holocaust-related affiliations, such as groups based on similar Shoah experiences (ghettoes, specific concentration camps, resistance, hiding), township (landsmanschaftn) organizations, and formal programs (community-based regular meetings with commemorative, educational and or psychotherapeutic goals). Within the cultural/religious identity dimension, family intergenerational continuity of religious affiliation/practice was originally scored as an ordinal variable where 0 = no continuity, 1 = some continuity, and 2 = complete continuity, meaning the child had the same religious affiliation (affiliated, non-affiliated) and practice (secular, observant) as did his/her mother, father, mother’s parents and father’s parents. Preliminary analyses established that the same structural (path) model fit the data in both settings. Both in North America and in Israel, the effects of family history and post-Holocaust family milieu on offspring’s reparative adaptational impacts were primarily indirect, through parents’ post-trauma adaptational styles. In this paper, we thus focus on testing (1) within-setting effects of continuity on parents’ intensities of victim, numb and fighter styles and (2) within-setting effects of parents’ styles on offspring’s reparative adaptational impacts. We tested these effects in a series of 2 x 2 ANOVAs, crossing sociocultural setting (North America versus Israel) and one of the independent (predictor) measures of the identity dimensions. A nested design provided tests for (a) the overall effect of sociocultural setting, (b) the overall effect of the independent variable, and (c) the separate effects of the independent variable within North America and within Israel. Independent variables were dichotomized to maintain adequate sizes for each group. In the first set of analyses with parent styles as the dependent (predicted) measures, identity groups were: below average versus above average for broken generational linkages; no versus yes for presence/survival of mother’s mother; no versus yes for affiliation with Holocaust related organizations and groups; and none or some versus complete for continuity in religious affiliation and practice. In the second set of analyses with reparative adaptational impacts as the dependent measure, each parent style measure was dichotomized at the scale midpoint into lower (< 3) or higher (3-5). Participant’s gender, Holocaust trauma (parent’s internment during the Holocaust), and the family’s post-Holocaust socioeconomic status were included as covariates in the ANOVAs. Effects were thus adjusted to exclude covariance that might better be explained by one of these statistical controls. Table 1 (see below) provides descriptive data on all variables included in the analyses separately for each sociocultural setting. With regard to the dependent variables, on average, North American mothers and fathers were perceived by their children to have higher intensities of victim style and fighter style than Israeli mothers and fathers but no more intense numb styles. Offspring’s reparative adaptational impacts did not differ between settings. As for the covariates (control variables), a greater percentage of Israeli respondents were daughters. Israeli mothers and fathers did not differ from North American mothers and fathers in the prevalence of internment without escape during the Holocaust. A higher percentage of North American families were upper middle/high class. Table 1 (see below) also shows between-setting differences in the identity dimensions. Israeli children of survivors perceived greater broken generational linkages (intrapsychic/intrapersonal dimension) than did their North American counterparts. No differences emerged between settings in the prevalence of the survival/presence of the mother’s mother (interpersonal/familial dimension). Compared to North American fathers, Israeli fathers were more frequently affiliated with Holocaust-related survivor organizations (interpersonal/communal dimension), but Israeli and North American mothers did not differ. Israelis and North Americans also did not differ in the frequency of complete family continuity in religious affiliation/practice (cultural/religious dimension). 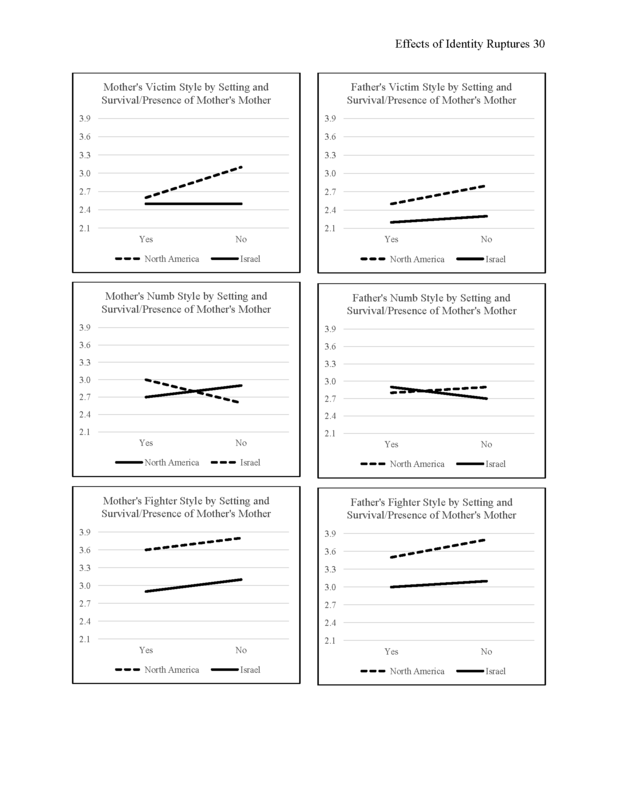 Tables 2 and 3 present (see below) the ANOVA results and within setting effects of the four identity measures on the intensities of mothers’ and fathers’ victim, numb, and fighter styles. The F value is the test of the statistical significance of the effect for the total sample (both settings combined). B is the estimate of the magnitude (slope) and direction of the effect in each setting, and SE B is a measure of the likelihood of error in B. The likelihood of the estimate being a little too large or a little too small is consistently greater for the Israeli setting because the Israeli sample is smaller. There will then be times when the B’s are of comparable size in North America and Israel but statistically significant only in North America. In drawing conclusions about the effects of the variables within and between settings, it is useful to consider both the effect size (B) and its statistical significance (p). Broken generational linkages had strong effects on parents’ victim style in North America, but no effect in Israel. These findings are illustrated in Figure 1. The data points are group marginal means, adjusted for participant’s gender, mother’s or father’s Holocaust experience, and family SES. The first figure is for mothers’ intensity of victim style. Israeli mothers with below and above average broken generational linkages did not differ from one another, whereas North American mothers with above average broken generational linkages had significantly more intense victim styles than did North American mothers with below average broken generational linkages. Described alternatively, the plot shows that when broken generational linkages were low, there was virtually no difference between Israeli and North American mothers, but when broken generational linkages were high, the difference was moderately large (Cohen, 1992). The second figure echoes the first: broken generational linkages had no effect on fathers’ victim style in Israel, but did have an observable effect on father’s victim style in North America. A different pattern emerged for parents’ numb styles. The effects of broken generational linkages were moderately large in Israel as well as in North America. Yet a third pattern emerged for parents’ fighter style: there were no effects in either setting. The effects of survival/presence of the mother’s mother on mother’s and father’s victim styles were statistically significant in North America but not in Israel. These findings are illustrated in Figure 2. As shown by the solid line, the two groups of Israeli mothers whose mothers did (Yes) or did not (No) survive the Holocaust did not differ from one another. In contrast, the difference between the two groups of North American mothers (dashed line) was moderately strong. Alternatively, the figure can be described thus: when their own mothers had survived, there was virtually no difference between Israeli and North American mothers, but when they had not, there was a moderately large difference. Either description suggests that the Israeli setting protected mothers against the impact of this loss. The figure to the right shows a similar though less pronounced pattern for fathers’ victim style: while survival/presence of the mother’s mother had only a minimal effect in Israel, it did have an observable effect in North America. Survival/presence of mother’s mother had no effects on either parent’s numb style in either setting. Effects on fighter style were statistically significant only in North America but were in the same direction in Israel. The effects of affiliation with Holocaust-related organizations on mother’s victim style were significant only in North America, but the effect size was equivalent in Israel (see Figure 3); intensity of victim style was lower in mothers who had formal affiliation with Holocaust-related organizations. Affiliation had no effect on father’s victim style in either setting. The effects of affiliation with Holocaust-related organizations on numb style were significant and quite strong, but only in Israel. Affiliated Israeli mothers had much lower intensities of numb style than unaffiliated Israeli mothers and North American mothers, regardless of their affiliations. The same pattern emerged in fathers. 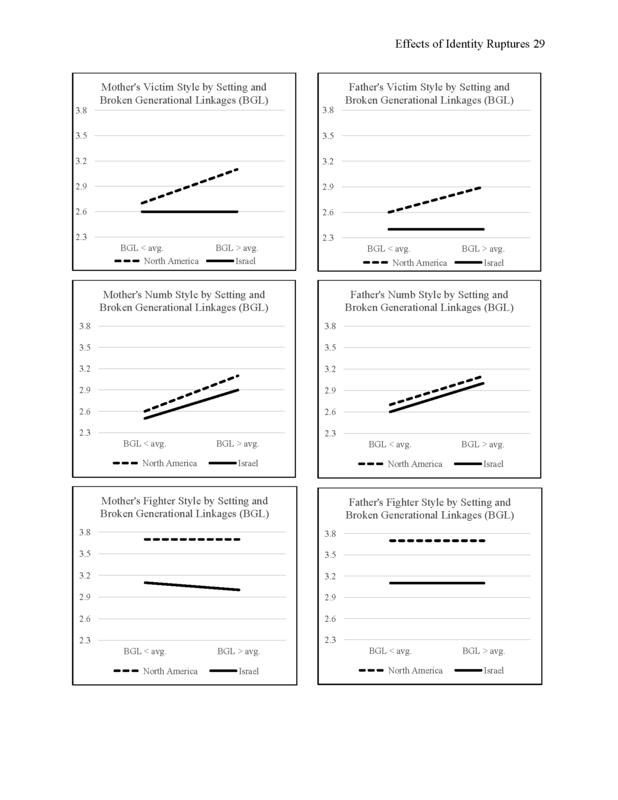 Affiliation had no effect on either parent’s fighter style in either setting. 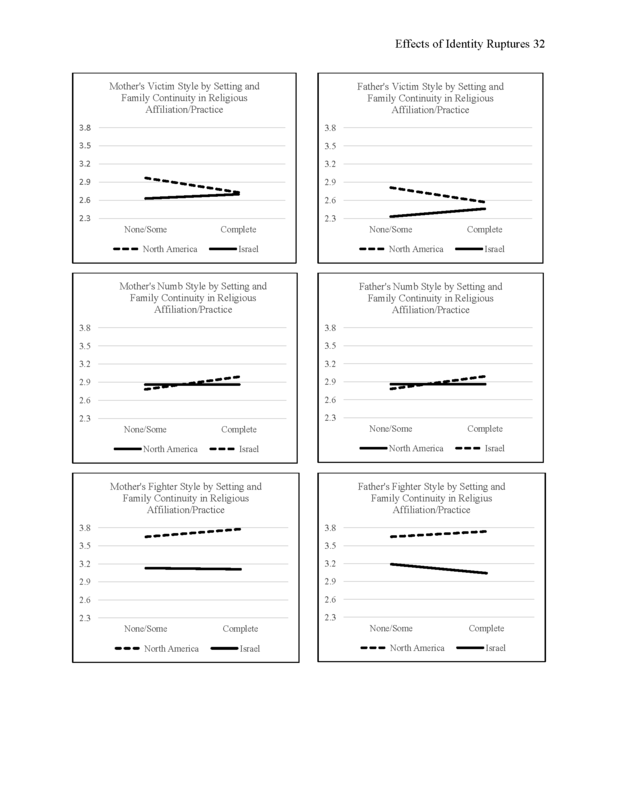 Effects of family continuity in religious affiliation/practice were limited to mothers’ and fathers’ victim styles in North America (see Figure 4): North American parents with no/some continuity had more intense victim styles than North American parents with complete continuity, while Israeli parents with no/some continuity did not differ from Israeli parents with complete continuity. These tests replicated previous findings that reparative adaptational impacts were strongly related to parents’ victim styles (mother F = 77.78, father F = 73.95, ps < .001) and numb styles (mother F = 42.51, father F = 27.44, ps < .001), but were not related to parents’ fighter styles (mother F = 2.15, father F = 2.82, ns). Effects of parents’ styles on their children were comparably strong (all ps < .001) in the two settings: For mother’s victim style, North American B = .70, Israeli B = .74; for father’s victim style, North American B = .73, Israeli B = .62; for mother’s numb style, North American B = .56, Israeli B = .49; and for father’s numb style, North American B = .46, Israeli B = .40. We had previously reported (Danieli et al., 2015a) that North American children of survivors perceived their mothers and fathers to have higher intensities of victim and fighter style than did their Israeli counterparts. We speculated that Israel offered reparative advantages that extended beyond the opportunity to start and build a new life in North America. In this paper, we set out to systematically test the hypothesis that the Israeli sociocultural setting buffered, counteracted, or helped heal at least some of the adverse effects of the identity ruptures suffered by Holocaust survivors (see Eitinger, 1980). Guided by the aforementioned TCMI framework (Danieli, 1998), we found that the effects differed in strength depending upon the identity dimension (intrapsychic/intrapersonal, interpersonal/familial, interpersonal/communal, cultural/religious), adaptational style (victim, numb or fighter), and setting (Israel or North America) considered. The expected pattern was observed for three of the four identity dimensions, but only for victim style. Even when the internal generational linkages were broken (intrapsychic/ intrapersonal identity), even when the mother’s mother perished (interpersonal/familial identity), and even when the family’s religious affiliation and practice changed across generations (cultural/religious identity), Israeli survivors showed relatively low levels of victim style. In contrast, North American survivors’ intensities of victim style increased substantially in the presence of these identity ruptures. The interpersonal/communal identity dimension, indicated by affiliation with Holocaust-related organizations, followed a different pattern. Affiliation with survivor organizations had equivalent effect sizes (Bs) on victim style in the two settings. These findings concur with previous writings about the unique reparative and preventive value of group affiliation. First and foremost, group and community modalities may counteract survivors’ sense of alienation and isolation and affirm the central role of “we-ness” and the need for a collective search for meaningful response after massive trauma (Danieli, 1985c). Spontaneous and designed initiatives, such as establishing survivor kibbutzim and township (landsmanschaftn) organizations as well as pioneering community-based, awareness, therapeutic and therapy groups acknowledged the wisdom of utilizing the group modality for survivors and their offspring (e.g., Awareness groups for Children of Holocaust Survivors in Boston, Fogelman & Savran, 1979; Café 84 in Stockholm, Fried & Waxman, 1988; Café Europa in Los Angeles, Kinsler, 1988, 1995; Group Project for Holocaust Survivors and their Children In New York City, Danieli, 1981b, 1989; AMCHA in Israel, Kellerman, 2009). Survivors’ and offspring’s groups potentially help rebuild a sense of extended family and community (i.e., the interpersonal communal identity dimension) which were lost during the Holocaust. Our findings that affiliated survivors, regardless of sociocultural setting, show less intense victim styles than unaffiliated survivors are consistent with Danieli’s (1989) observations that group members together find words to articulate their anguish, learn to observe and identify victimization-derived behaviors in themselves and others and use peer reflection, clarification, confrontation, and interpretation for change. Groups can also encourage and demonstrate mutual caring which ultimately enhances self-care in survivors and their families. Through the exchange of mutual experiences, group members also come to appreciate their differing post-trauma adaptational styles. Realizing the heterogeneity beyond their commonality helps develop respect and tolerance for the particularity of the individual which paves the way for self-actualization unique to each group member. But on numb style, affiliation showed an effect only in Israel: affiliated Israeli mothers and fathers had much less intense numb styles than both unaffiliated Israelis and North American mothers and fathers, regardless of their affiliations. Thus, affiliating with survivor organizations appeared to be helpful in reducing the intensity of numb style in Israel but not in North America. This intriguing finding calls for an in-depth multidisciplinary examination of the extrinsic as well as intrinsic nature of the survivors’ groups and what they provided in these two sociocultural settings. Were Israeli survivors’ groups more accepting of heterogeneous adaptational styles and less pressuring for conformity of “acceptable” behaviors than were North American survivors’ groups? Did they utilize more activities that were reparative, allowing for open sharing of pre-, during, and post-Holocaust experiences and of losses? Were group processes more inclusive, collaborative, active and flexible? Did they encourage ongoing friendships? Did they actively seek and reach out to isolated survivors? Answers to such questions might point to specific measures that alleviate survivors’ emotional numbness and isolation. In both North America and Israel children perceived their parents to have more fighter style than victim or numb style characteristics. Yet, the identity dimensions were only minimally related to intensity of fighter style. The influence of sociocultural setting might have outweighed the potential effects of individual differences in identity ruptures. Without exception, in each condition of each independent variable (see Figures 1-4), North American mothers and fathers were perceived by their children to have more intense fighter styles than Israeli mothers and fathers. Intense fighter style reflects an exceptionally strong emphasis on maintaining Jewish identity, honoring history and memory, standing up to authority, fighting injustice, and striving for readiness and success. Regardless of their identity ruptures North American Holocaust survivors may have felt a more pressing need to pass on these values to their children than did survivors who settled in Israel, a Jewish state where Jewish identity is a given and supported by a Jewish sociocultural value system. And it might be precisely because of their parents’ teachings that children of survivors in North America showed as much continuity in religious affiliation/practice as children of survivors in Israel and actually had lower perceptions of broken generational linkages (see Table 1 below). Future research should examine whether this pattern is unique to North American survivors’ families or common to Holocaust survivors and offspring living as minorities in the Diaspora under differing levels of anti-Semitism. Despite the numerous comparative interpersonal and religious/cultural advantages of the Israeli setting in lessening survivors’ sense of victimization, Israeli offspring nonetheless reported a higher level of broken generational linkages in their families. This finding recalls Eitinger’s (1980) observation that, “The Jewish survivors who went to the State of Israel in 1948 were exposed to a sort of milieu therapy that must surely be regarded as unique in the history of psychiatry” (p. 157); yet that “Intrapersonal difficulties were “forcefully” repressed but not solved, and therefore they exist up to the present day—often, however, in the background of a personality that to all appearances functions socially in a more or less satisfactory manner” (p. 158). The Israeli reality of ongoing threats to its continued existence might mirror and thereby intensify the inner experience of broken generational linkages in survivors’ offspring there (see also Solomon, Kotler, & Milkulincer, 1988). Limitations to our study have been detailed previously (Danieli et al., 2015a, 2015b, under review). In brief, these include the use of convenience sampling, a recruitment approach that might over- or under-represent certain segments of the survivors’ offspring population, absence of a control group of non-survivor families, reliance on retrospective perceptions of respondents, and attrition between Parts I and III of the survey. Our data are correlational; the effects we’ve shown here are necessary but not sufficient for establishing causation. Despite these limitations, our results demonstrate the advantages of simultaneously examining the influences of cultural and situational factors for understanding the legacies of trauma and of simultaneously considering multiple outcomes. Had we studied only victim style, numb style or fighter style, our conclusions would have been different. As the TCMI framework suggests, adaptation to trauma is multidimensional, diverse and culturally rooted. Like researchers, clinicians working with survivors must develop competence in the local culture. The findings support three specific recommendations for enhancing clinical interventions with survivors and their offspring: (1) Take a full multigenerational history of trauma as a routine part of history-taking and diagnostic evaluations. 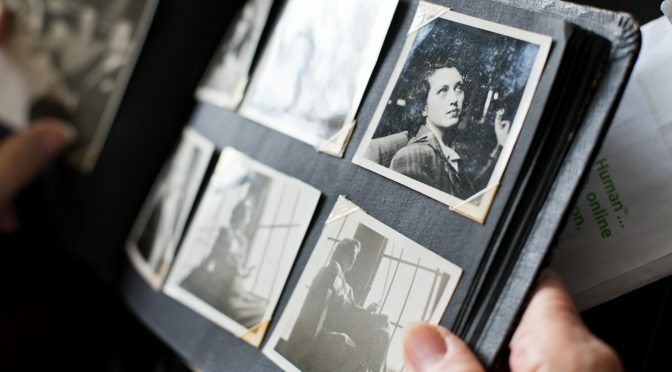 The Danieli Inventory itself could guide clinicians in identifying and exploring the main features, meanings and roots of their Holocaust survivors’ and offspring’s emotions, behaviors, attitudes, world views and relationships. As the history is being taken, the principle of integration should inform the choice of therapeutic modalities or interventions. Combining therapeutic modalities is especially helpful in working through long-term and intergenerational effects of victimization. The central therapeutic goal is to meaningfully integrate rupture and discontinuity. (2) Construct a multi-generational family tree. Although this may trigger an acute sense of pain and loss, it serves to recreate a sense of continuity and coherence damaged by traumatic legacies. One invaluable yield of exploring the family tree is that it opens communication within families and between generations and makes it possible to work through toxic family secrets. (3) Break the silence about traumatic experiences within the family, community and society (Danieli, 2009, 2014). Whether family therapy is feasible or not, and regardless of the therapeutic modality used, individuals and families should be viewed within the context of their ruptures and continuities, their intrapersonal, interpersonal and religious/cultural identity dimensions (Danieli, 1993). The Danieli Inventory of Multigenerational Legacies of Trauma as well as the two- or multi-setting methodological approach of the present paper should be applicable, with proper modifications (e.g., other languages), to the entire population of Holocaust survivors’ offspring. Their applicability should be evaluated as well by clinicians, investigators and others working with the myriad individuals, families and communities worldwide victimized by other genocides, crimes against humanity, and war crimes. Our findings also highlight the need for studying massively traumatized people comparatively both in their “homelands” and in their respective diasporas. This is further underscored by the staggering escalation of forced displacement noted by the United Nations High Commissioner for Refugees, Antonio Guterres (2015): in 2014, 42,500 people were displaced by conflict per day. An increasing number of populations face the daunting circumstances of conflicts and difficult living conditions, and ongoing, chronic traumatic stress that spawn multigenerational consequences. It is therefore a clinical, research and social policy task to adopt a multidimensional, multidisciplinary (and multisectoral), longitudinal, integrative framework in designing long- as well as short-term intervention, postvention and prevention programs. Danieli, Y. (1981b). The group project for Holocaust survivors and their children. Children Today, 10(5), 11, 33. Danieli, Y. (1982). Therapists’ difficulties in treating survivors of the Nazi Holocaust and their children. Dissertation Abstracts International, 42(12-B, Pt 1), 4927. (UMI No. 949-904). Danieli, Y. (1988). On not confronting the Holocaust: Psychological reactions to victim/survivors and their children. Remembering for the future, theme II: The impact of the Holocaust on the contemporary world (pp. 1257-1271). Oxford: Pergamon Press. Danieli, Y. (1989). Mourning in survivors and children of survivors of the Nazi Holocaust: The role of group and community modalities. In D. R. Dietrich, & P. C. Shabad (Eds. ), The problem of loss and mourning: Psychoanalytic perspectives (pp. 427-460). Madison: International Universities Press. Danieli, Y. (1993). The diagnostic and therapeutic use of the multi-generational family tree in working with survivors and children of survivors of the Nazi Holocaust. In J. P. Wilson & B. Raphael (Eds. ), The international handbook of traumatic stress syndromes. [Stress and Coping Series], Donald Meichenbaum, Series Editor]. New York: Plenum Publishing. Danieli, Y. (2009). Massive trauma and the healing role of reparative justice. Journal of Traumatic Stress, 22(5), 351-257. Danieli, Y. (2014). Healing aspects of reparations and reparative Justice for victims of crimes against humanity. In J. M.Wemmers (Ed.) Reparation for Victims of Crimes Against Humanity (pp. 7-21). New York: Routledge. Danieli, Y. Norris F. & Engdahl, B. (2015, under review). Multigenerational legacies of trauma: Data-based integrative modeling of the what and how of transmission. Danieli, Y., Norris, F., Lindert, J., Paisner, V., Engdahl, B., & Richter, J. (2015a). The Danieli Inventory of Multigenerational Legacies of Trauma, Part I: Survivors’ posttrauma adaptational styles in their children’s eyes. Journal of Psychiatric Research, 68, 167-175. Danieli, Y., Norris, F., Lindner, J., Paisner, V., Kronenberg, S., Engdahl, B., et al. (2015). The Danieli Inventory of Multigenerational Legacies of Trauma, Part II: Reparative adaptational impacts. American Journal of Orthopsychiatry, 85, 229–237. Dawidowicz, L.S. (1975). The war against the Jews 1933-1945. New York: Holt, Rinehart and Winston. Eitinger, L. (1980). The concentration camp syndrome and its late sequelae. In J.E. Dimsdale (Ed.). Survivors, victims and perpetrators: Essays on the Nazi Holocaust. (pp. 127-162). New York: Hemisphere. Epstein, H. (1979). Children of the Holocaust: Conversations with sons and daughters of survivors. New York: Putnam. Fogelman, E. & Savran, B. (1979). Therapeutic groups for children of Holocaust survivors. International Journal of Group Psychotherapy, 29(2), 211-235. Fried, H. & Waxman, H.M. (1988). Stockholm’s Cafe 84: A unique day program for Jewish survivors of concentration camps. The Gerontologist, 28(2), 253-255. Kellerman, N.P.F. (2009). Holocaust trauma: Psychological effects and treatment. New York: iUniverse, Inc.
Kinsler, F. (1988). The loneliness of the Holocaust survivor, loneliness and togetherness: Individual, family and society. Journal of Psychology and Judaism, (12) 3, 156-177. Kinsler, F. (1995). Group services for Holocaust survivors and their families. In J. Lemberger (Ed.) A global perspective on working with Holocaust survivors and the second generation (pp. 59-80). Jerusalem: AMCHA. Klein, H. (1972). Holocaust survivors in kibbutzim: Readaptation and reintegration. Israel Annals of Psychiatry and Related Disciplines, 10 (78-91). Klein, H. (1973). Children of the Holocaust: Mourning and bereavement. In E.J. Anthony & C.
Koupernik (Eds.). The child in his family: The impact of disease and death. (pp. 393-409). New York: Wiley. Luchterhand, E. (1980). Social behavior of concentration camp prisoners: continuities and discontinuities with pre- and postcamp life. In J.E. Dimsdale (Ed.). Survivors, victims and perpetrators: Essays on the Nazi Holocaust. (pp. 259-282). New York: Hemisphere. Lifton, R. J. (1979). The broken connection. New York: Simon & Schuster. Matussek, P. (1975). Internment in concentration camps and its consequences (D. Jordan, & I. Jordan, Trans.). New York: Springer Verlag. (Original work published 1971). Segev, T. (1994). The seventy million: The Israelis and the Holocaust. New York: McGraw-Hill. Sigal, J.J. & Weinfeld, M. (1989). Trauma and rebirth: Intergenerational effects of the Holocaust. New York: Praeger. Solomon, Z., Kotler, M. & Milkulincer, M. (1988). Combat-related post-traumatic stress disorders among second generation Holocaust survivors: Preliminary findings. American Journal of Psychiatry, 145, 865-868. Wijsenbeek, H. (1979). Is there a hiding syndrome? In Israel-Netherlands symposium on the impact of persecution. (Jerusalem, October 1977). Rijswijk, Z.H., The Netherlands: Ministry of Cultural Affairs, Recreation and Social Welfare, pp. 68-73. Winnik, H.Z. (1979). The impact of persecution (general background of the problem in Israel). In Israel-Netherlands symposium on the impact of persecution. (Jerusalem, October 1977). Rijswijk, Z.H., The Netherlands: Ministry of Cultural Affairs, Recreation and Social Welfare, pp. 18-24. Note: B is the strength of the effect, the slope of the mean difference between levels of the independent variable within each setting (see figures). Figure 1. Effects of broken generational linkages by sociocultural setting: Group marginal means. Figure 2. Effects of presence/survival of mother’s mother by sociocultural setting: Group marginal means. Figure 3. 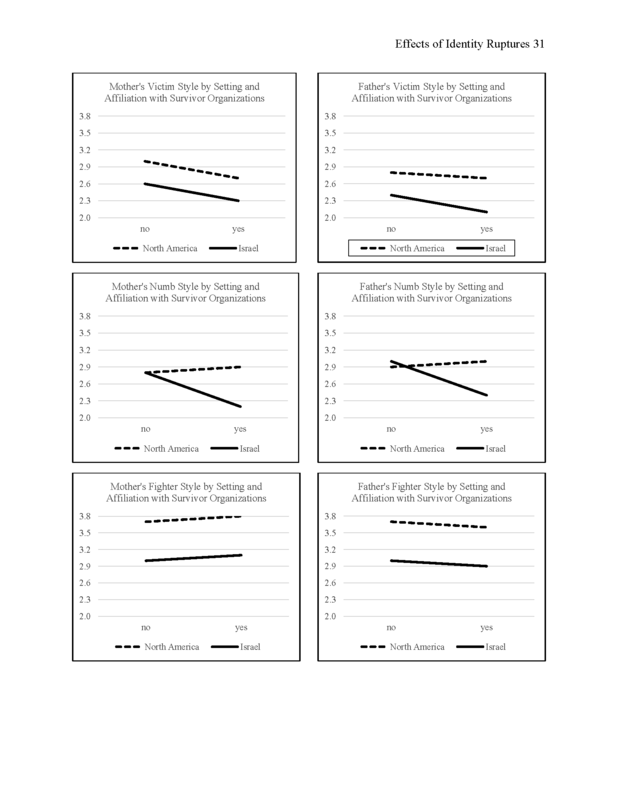 Effects of affiliation with survivor organizations by sociocultural setting: Group marginal means. Figure 4. Effects of continuity in religious affiliation and practice by sociocultural setting: Group marginal means.